Madison Kasparkova always thought she understood how Karma works. Do good things and you'll be rewarded, do something bad and Karma will make sure you get what you deserve. But when Maddy's boyfriend cheats on her, nothing bad comes his way. That's why Maddy starts the Karma Club, to clean up the messes that the universe has left behind. Sometimes, though, it isn't wise to meddle with the universe. It turns out Karma often has plans of its own. When you mess with karma, karma will mess with you. 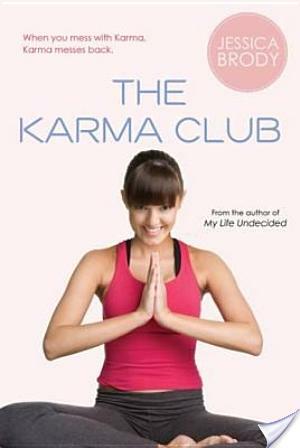 The Karma Club by Jessica Brodyexplores the eastern philosophy of karma in a contemporary setting. Madison Kasparkova has been fairly lucky. She’s got good friends and an almost-perfect boyfriend. Things are definitely going her way, until one day her boyfriend burns her by cheating on her with the most popular girl in school. Clearly, every school has a mean girl, and this boyfriend stealer is that girl. It seems as though karma is not intervening, so Maddy and her friends take karma into their own hands. What results is pranks! Pranks galore! I have this to say about the pranks, plz moar pranks! I loved it. I thought the pranks were both funny AND appropriate. Each person they pranked got what they deserved. Hell seriously hath no fury like a woman scorned. It’s petty of me, but I love it when bad people get what is coming to them. Besides emotions, there are friendships! FRIENDSHIPS! Girls who help each other out without an underlying backstabber reasons. I like that girls can be friends without being catty to each other. PLZ MOAR OF THIS. There’s a great message in The Karma Club by Jessica Brody, but it is cloaked in fun and not seriousness, thank goodness. Honestly, I read this book in about two and half hours, that is how great it was. I read this and set it down with a smile and proceeded to tweet about how much I enjoyed it. The Karma Club is absolutely a book I recommend. Also, what really pushed me into reading The Karma Club was one of the most well done book trailers I have ever seen! Can't wait to read this one and I agree…that trailer is a standout. Wish more book trailers would be this good! I read Brody's adult books – Fidelity Files and Love Under Cover and really enjoyed them. I am looking forward to trying her YA debut. Thanks for the review! Hi! I found your blog through the Hop and I'm really glad I did because it's great :). I'm your latest follower so I'm sure I'll be back soon! Great review. I loved reading this super fun review. I've never heard of this book, but you sold it by talking about friendships between girls – why are there not more books like this?